Sally McKune, as cited in Frederic G. Mather (1844-1925), “Early Days of Mormonism”, Lippincott’s Magazine 26:152 (Philadelphia: J. B. Lippincott, Aug. 1880). p. 202. This information is also given in “Who Really Wrote The Book of Mormon” by Cowdrey et al. (2005). p. 188. 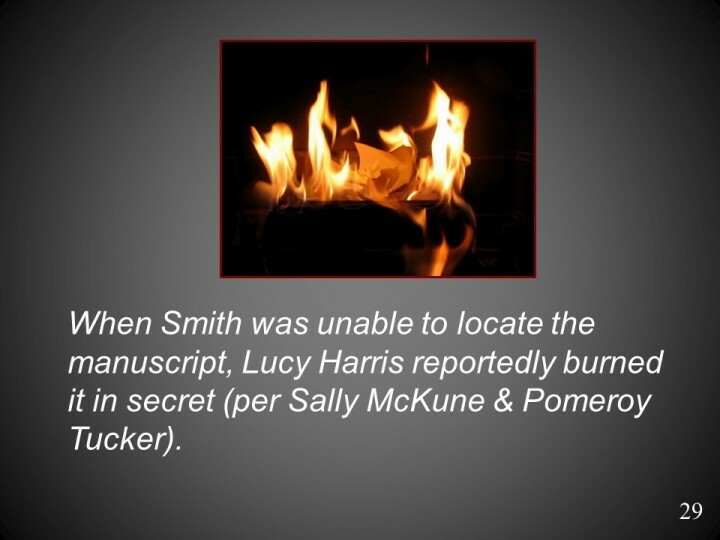 Pomeroy Tucker reported that Lucy Harris burned the manuscript. This is claimed in: Tucker, Pomeroy (1867), Origin, Rise and Progress of Mormonism, New York: D. Appleton. In in “Who Really Wrote the Book of Mormon” (2005), p. 487, Cowdrey et al., reported that Dr. Ezra Semour lived in Broome Country.